Although staff firmly believe and tell guests that there are no ghosts in the building, bottles of wine jump off the shelves without being touched. There have been reports of apparitions in old-fashioned clothes wandering the hallways and the lobby before simply vanishing. The ghost of a young girl in a pink dress has been seen in the lobby. The ghost of a woman in a wedding gown has been seen staring down into the street late at night. The ghost of a bellman has been seen wandering the fourth level, who walks through closed doors before disappearing. The ghost of a man in a black suit has been seen in the hotel laundry, and often waves to workers. Taps turn on and off by themselves, lights go on and off when no one is around, people are brushed against by people who aren’t there and ghostly laughter has been heard. An evil presence has been felt in Room #824 of the hotel. I was originally a student that attended Arkansas School for Mathematics, Sciences, and the Arts and we held our prom at the ball room in here as well as host our swing dance club here. I don’t remember any paranormal activity during the events in particular hosted inside the building, but I did have a friend who snapped a photo of a ghost standing in one of the windows in the upper floors outside the left side of the Arlington. A woman with no face and hands passed up against the window. It was while we were heading back from prom during an uneventful prom evening. Boy did it turn eventful! But if you want one of the most haunted places in Hot Springs- if was my school. Right down from the Arlington. Formally known as St. Joseph and converted to a college preparatory high school (government funded) our dorm rooms were former ICU rooms and our gym was the morgue. It’s a good thing they built a new dormitory recently,eh? My grandparents n many other family members have bn n the hospital at the AMSS when it was st Joe’s. My x husband worked on some of the remodeling.I’ve bn all over that place for many years lived up the rd from it for at least a dozen years n my grandparents lived there up the rd for well longer than I’ve bn alive. I don’t doubt it’s haunted but the o.r.’s & icu’s & the morgue( which was n the basement btw) for the most part we’re all sealed off whole giant room with some hospital equipment still there just walled up & left like a creepy time capsule so as I say the hauntings r undoubtedly real but rest easy young one’s they didn’t put u n a death room.lol. My husband and I were unable to do anything this year for our anniversary on May 1st because of his and my mother’s health issues. So when we had a chance to join a group of friends for a meditation in Hot Springs at her new home, we took it. There were other folks already committed to staying at our hostess’s home so we decided to go to the Arlington Hotel and enjoy the spa and ambiance. The hotel itself was once magnificent but has fallen into a sad state of disrepute. It has character but is in dire need of some tender loving care and a make over to bring back its former glory. In any case, we booked a room and were told it was on the 3rd floor but I asked if we couldn’t be higher up on the 7th or 8th floors instead. They moved us to 732. The beds were lumpy but really comfortable with great pillows and the a/c was set correctly for us and blew almost non-stop keeping the mugginess of the day at bay. There were two full-sized beds on the left as you entered with a table between them and on the right near the window was a secretary desk with a clunky wooden chair. I had no problem getting comfortable in one bed and my husband was in the other after we’d come back from the hot tub outside on 7th floor. What an amazing view that was and we were all alone up on the side of the mountain looking over the trees and pool area. Once we were in bed I fell asleep quickly. However, I couldn’t seem to stay asleep. I’d fall asleep then wake up sure it was hours later only to find it had been 17 or 20 minutes. I remember after the 3rd time I woke up thinking, “I wonder if something keeps waking me up? If this place is haunted.” But I shrugged it off as insomnia due to non-usual noises and went back to sleep. At 4:07 I woke up and looked again at the clock. Exasperated I sighed and told myself to go to sleep again. I rolled over towards the window, put both hands over my head and fell asleep. I’ve lived in some pretty old houses all over the country. I’m familiar with clanky pipes, radiator sighs, hisses and knocking that loose fixtures in the wall can cause. I don’t spook easily and I don’t jump to conclusions. Having decided that it was water, I started to go back to sleep but then thought, “Wait a minute, why is it running straight up and obviously from the sound of it from 3 floors below? That isn’t normal. Usually the water runs horizontally or down pipes, not up, in my experience. I decided that I was not a plumber and who knew what might make such a noise in this old of a hotel. I closed my eyes and drifted off to sleep again. Just as I felt myself nod off, I thought I heard my husband say “There’s someone in our room.” I opened my eyes and tried to roll over to face him and ask what he meant, but I couldn’t move. “Oh great,” I thought, “I’ve got sleep paralysis. So this is what it feels like.” Just about that time I saw a young 18-19 year old woman sitting at the desk. The desk wasn’t the brown wooden clunky set that was in my room when I went to bed. It was a much daintier black painted desk with queen anne like leg curves and a very dainty matching black chair with a rounded back and matching legs to the desk. The girl was sitting on the seat of the chair, her right leg extended in front of her on the floor and her left heel resting in the seat of the chair. She had both her arms wrapped around her left leg and her head cocked to the right looking at me. When I saw her she laughed aloud. Her voice was extremely melodious, reminding me of cut crystal clinking together. Very pleasant laugh. Her eyes were dark. Her hair was dark brown or black, short, curly and she wore a sort of hat that reminds me of bell boy hats only it was beaded with black glass beads that shown brightly and obviously weren’t cheap. Her dress was like a V neck halter top type gown that tied or hooked behind her long, slender, pale white skinned neck. It too was heavily beaded with black glass like beads that shone with little dark rainbows when she moved and the light hit them. I took all this in very quickly and tried to move, but found I could not. I knew it was probably sleep paralysis and that I might be dreaming, but I was able to think all this, ask myself questions, try to move my body, tried multiple times to speak to my husband … all to no avail. I decided that if it was sleep paralysis, I wasn’t dreaming. Somehow I was seeing this young woman and hearing her. At this point, I realized I wasn’t afraid, though I certainly had every reason to be. I tried moving again, lowering my arms but they wouldn’t move. I tried to turn my head and it wouldn’t move. I tried to alert my husband but I couldn’t make a sound. I was getting angry. She laughed, stook up and turned to go. She moved through the end of my husbands bed towards the locked door. In the cutest little voice that reminded me of Betty Boop the cartoon she said,”I just wanted to say hi!” and left the room. Behind her as she swept out of sight there was something like a black veil that swept out with her but it seemed to come from all corners of the room then narrowed into a tornado shape as it went out the door behind her. I laid there thinking about what had just happened and how long I’d been awake. I looked at the clock and it said 5:27. I figured I had been dealing with her at least 20 minutes before she left and a few minutes more as I lay there thinking about it all. So roughly 5 a.m. when she appeared. He said, “Is she gone?” “Yea, she left after she said hi” then I told him what happened. I gave up. I think she thought I was trying to get out of the bill or something. When I asked a few others they told me about a man who died on the 7th floor somewhere along the hallway towards the pool and that if people stay in his room he makes them leave but no elaboration. I also read about a woman in a white wedding gown who crossed the pool area in front of a family of four then vanished upon hitting the doorway into the hotel. Make what you will of it. I am sure it was the only time I’ve experienced that sort of paralysis but from what I read today normally those entities that one dreams up while in such a state either sit on your chest and suffocate you or you just feel a sinister presence. Neither was true for me. If she was a ghost, I have no idea what she died from or of, she looked radiantly happy and innocent when I saw her. Just pokey. About to make a pilot for a show about southern haunts. Would love to talk to you..
well me and my dad went there and stayed in the most haunted room there and we did not even get scared by the ghost i went to sleep and my dad stayed up and watched tv all night and not once we did not see the ghost. i had an experience at the hot tub. me and my fiance were there for our 5 year anniversary and we went out to the hot tub to relax. we were there for probably 30 minutes when i was drug under. something grabbed my foot and pulled. when i got out i had bruises on my ankle and up my leg as if someone was climbing me. i thought i was going to die. I went here on my honey moon in 2000. I stayed here and a woman appeared in my dreams. I was in the dining room apparently, but we hadn’t gone there yet. It was so vivid and we were sitting at the table. She told me to stay away from my new husband and that he was going to mistreat me. She was so sad she told me how the man she was with mistreated her. I woke up the next morning and new exactly where to walk to the table I had been.I noticed we were right across from the Al Capone Suite. I insisted on searching the dining areas and could go exactly to the spot I had sat with the woman. She was wearing a black period dress, had black hair, beautiful, and had bright red lipstick. I have told this story since then. My ex husband did mis treat me and this dream gave me the strength to leave. I am remarried and happy now. Thank you friendly ghost! A friend and I stayed on the forth floor, Al Capone suite. Some time around 10pm, I gotten up to get a soda from the vending machine at the end of the hallway, for my friend, she was a bit jumpy so I went instead. Halfway there, I tripped over a discarded shoe. The other near the room door. A woman dressed in what only could be described as a maids uniform came out of a room and asked if I was hurt. I smiled and replied I’m clumsy. She smiled back then walked into a small room filled with sheets and pillows. As I passed by, she was gone. Door open, keys in the lock. A man hurried up the hallway and looked surprised. He asked if I was lost and I just told him I was getting a soda. I then headed into the vending area, but not before looking back in time to see him jerk the keys out, look around, jamming the keys in his pocket, then almost run the opposite way. The next day I talked to a manager and he denied ir at first. However that changed when I told him if I didn’t see a ghost house keep, there would be no reason to book another week. He was just worried I would get scared and give the Arlington a bad reputation. Loved, loved, loved this hotel! The history is amazing and would stay there again. My husband and I didn’t experience anything but, definitely felt like we went back in time. Myself and 3 of my girlfriends went on a “girl trip”. A nice getaway from our jobs and spend time together . There were many ghostly things that happened to two of us however, the only one I will mention (as the others are too long) is that as we were all in the bed for the night,( two of us in each bed), all 3 of my friends were dead asleep as It takes me forever to fall asleep and I’m a natural “night owl). My friend that was in the bed with me was completely still and she was lightly snoring so, I knew she wasn’t making any movement in the bed and all of the sudden, the bedspread was being pulled down off both of us. I didn’t move. I pretended like I was asleep. I was terrified. My heart was beating out of my chest as the covers were still traveling downward. I played dead and needless to say I didn’t move a muscle or sleep a wink the entire night. The next day we were at the front desk and I overheard the employees talking about the crew of Ghost Hunters that were in the building filming. That confirmed it for me even though I didn’t need confirmation. I knew EXACTLY what I had experienced. Absolutely the most frightening thing that has ever happened to me in my 55 years on this earth and this IS NOT FAKE!!! Several years ago, I had stayed at the Arlington . I went to a seminar. We were there about 3 days. The first night I woke up in the middle of the night and felt very scared. I could not go back to sleep. I felt shaky. I turned on the Christian channel and about 30 minutes later, the scared and shaky feeling left. 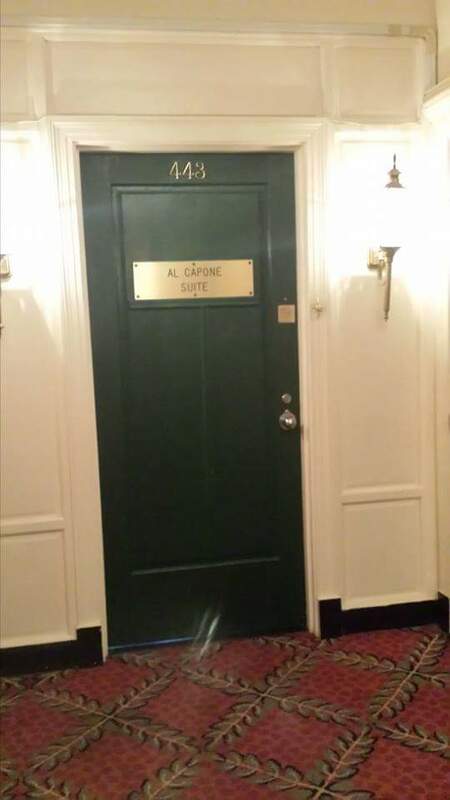 My room was just down the hall from Al Capone’s. Staying in Room 440 right now!!! Most quiet hotel that I have ever known. First night I slept like a Baby after a tough trip to get her. I Did, however, have many, many, many dreams about trying to manage this hotel. I am a manager, but not of hotels or hospitality at all. We will see how the night goes. I just think I am overwhelmed my it’s enormity, history and grandeur. I do want it to be better in some ways, but I have no experience with staying in such a place. We find it to be wonderful, so far. I won’t tell my wife about all the claims of hauntings and such as she might “see” things. I will report back tommorrow. In 2010 my wife and I stayed in a corner room on the 11th Floor. We ordered room service and a young lady came with our dinner but she was so nervous I had to run after her with my cash tip. It was obvious she was in a hurry to leave. After we ate i put the tray on a table near the window and walked back to bed. Just after I got into bed the lamp on that table crashed to the floor and the bulb broke. The room went dark and we laughed because it was so creepy. I definitely did not leave the lamp in a precarious position. Then about 3 AM the toilet flushed loudly. We both sat up in bed and looked at each other in amazement. We both had been asleep. We were a bit creeped out. The next morning I told the desk clerk what happened and he said they were not supposed to talk about it but they get a lot of comments like that, especially on the 11th (top) floor. I would never visit here even though I think its FAKE.